Why don't you just keep the peppers in pots all year, that way they are easier to bring indoors? 4 gallon pots for the longer lived peppers but smaller peppers can be kept in 2 gallons for a couple of years. I am trying to figure out right now if it is a good time to start lettuce seeds. I want them to be ready to transplant out about the second week of February. Should I start them now or wait another week? It is harder to time things since the cold slows everything down a lot. I usually fertilize when I pot stuff up, but I don't know if it would be a good idea to fertilize now since things aren't really growing except the weeds. I have to repot a lot of plants and I usually fertilize them at the same time. I do use slow release fertilizer so maybe it won't be that big a deal. My day temps are around 78 degrees so it may be warm enough, although most of the plants won't be doing much growing until the days are longer. I did start some cabbages, kale, onion, chives, parsley,lemon balm, and hyssop. The seeds of the kale and cabbage are ready to up pot. Hyssop took a long time to germinate but it is finally up now. 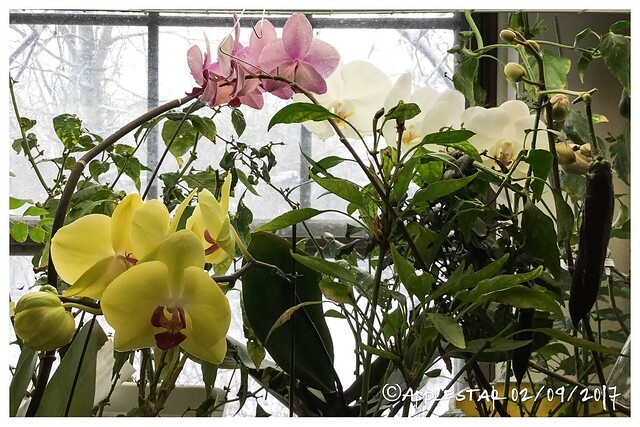 Your orchids look good but could use some repotting I think. 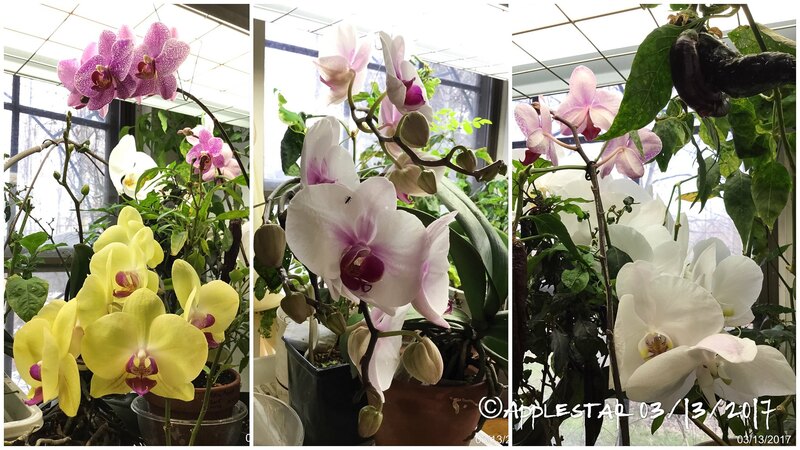 Most orchids need to be repotted every couple of years unless they are grown on rafts or media less. I am bad at repotting so I like to go with no media so there is nothing to decompose. 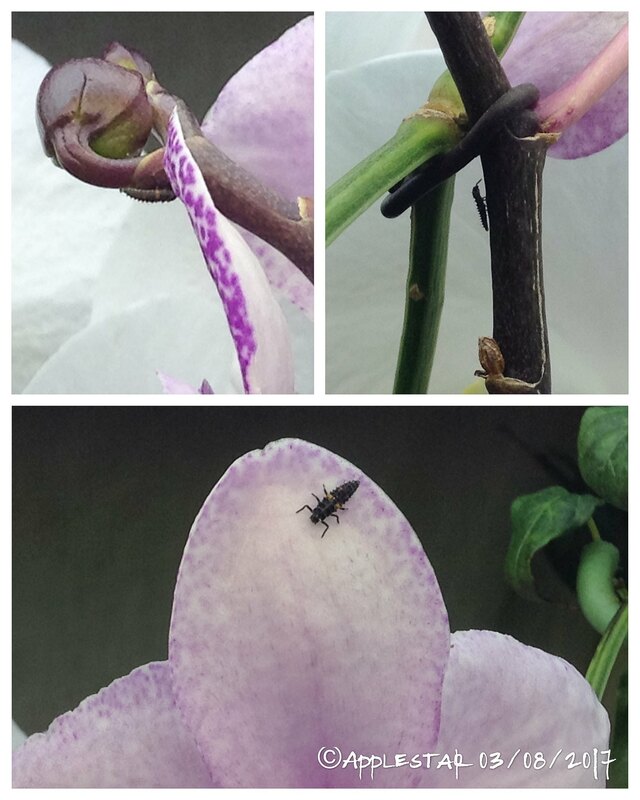 The orchids I grow in media seem to do worse. I can't believe how big the orchids got. They really liked where and how I kept them last summer -- on the back picnic bench under the mulberry tree. They are also in my new container method of planting in the upper half of 2 qt soda bottle slit open on one side, nested inside a clay pot. I'll definitely repot one or both that have not been potted that way in spring, and check the condition of the media in the others. 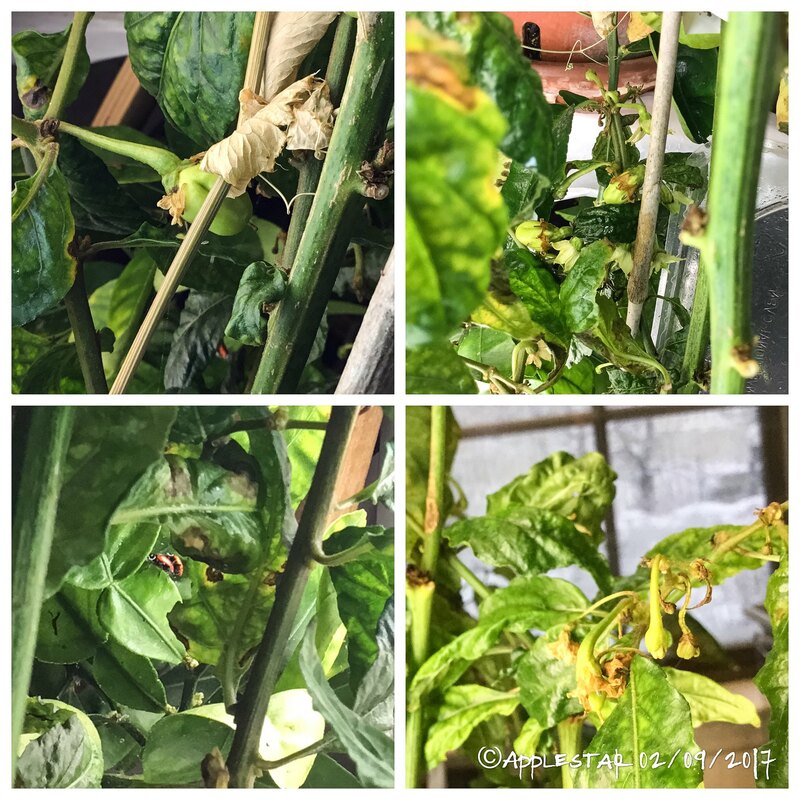 It's a tricky question about the peppers -- they do grow bigger and healthier when planted in right conditions in the ground, and they don't mind being severely root pruned to be potted to bring inside they are resting half of the time. Except for the SIP's the containers are not automated so more chance of stress especially with our annual summer drought. And I'm not good about fertilizing them regularly. Also, this way, I only bring in the ones "worthy" of saving. 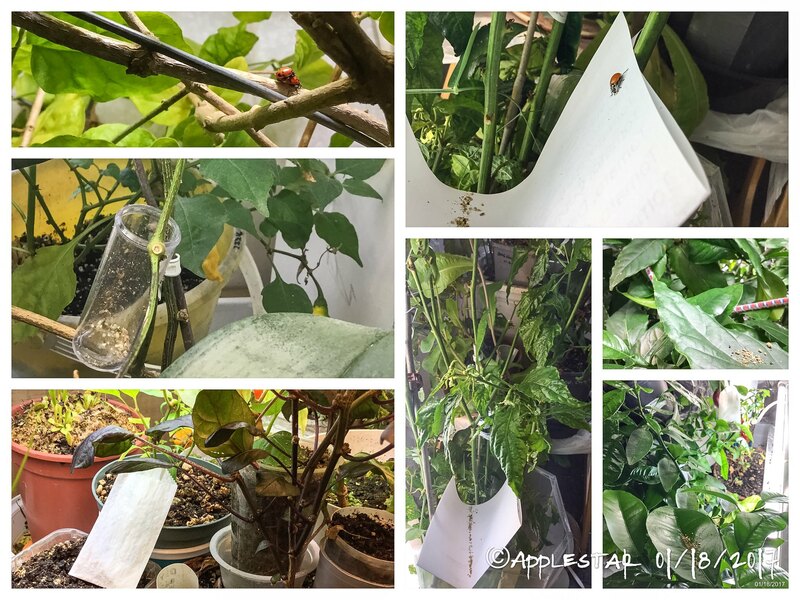 I ordered mixed predatory mites on Monday with an Amazon gift card received over the holidays -- the overwintering mature plants are hanging on with ladybugs and baby spiders (and suspected wild predatory mites) helping, but hoping for more protection from the indoor Garden Patrol. Soon-to-be-started seedlings are definitely more vulnerable. I had to go out today, but after returning, it occurred to me to mist all the plants with the ladybug nectar. Hopefully, they will desist now from munching up too many of the expensive new addition to the indoor Garden Patrol. ...so invisible Garden Patrol deployed. I'm going to be more diligent about misting twice daily in the morning and evening to hopefully provide periods of increased humidity for the new predators. 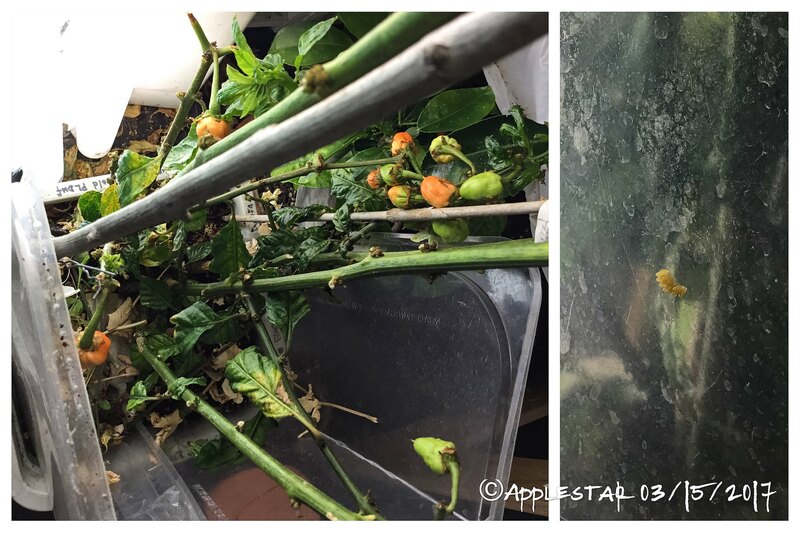 I think if tiny new buds like these don't turn russeted/brown and shrivel up, new growths that are showing mite infestation stress recover, and/or flower buds like these either set fruits or drop due to natural reaction to the colder temps, that would indicate their effectiveness. ...I just looked at random pepper leaves with the lighted loupe and on the very first one, saw one of the reddish predatory mites roaming around. That was really encouraging, but the next one I looked at had definite signs of pest mite infestation -- looked like their tiny eggs -- and the one after that showed three light colored smaller mites that I couldn't ID as pest or predatory, though for the most part, I think the ones visible under the low power x10-x15 loupe are predatory.... oh well. Time will tell. Last edited by applestar on Thu Jan 19, 2017 2:18 pm, edited 1 time in total. Reason: Updated with mite observation under loupe. 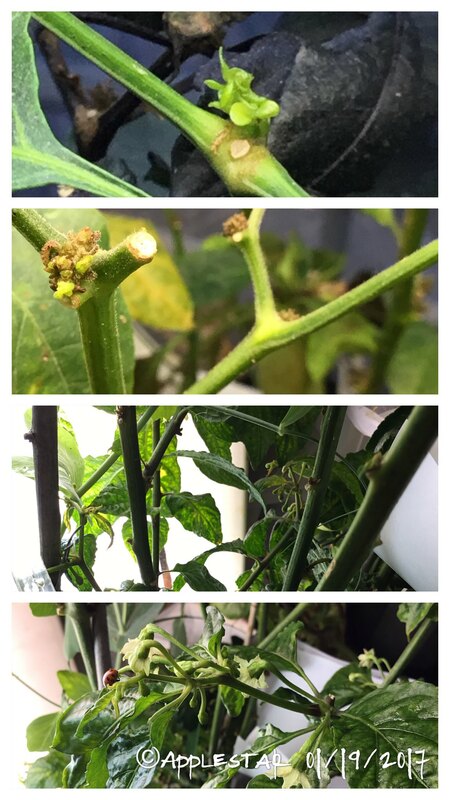 Peach Bhut Jolokia is blooming and setting fruits. I noticed a pair of ladybugs doing their thang. 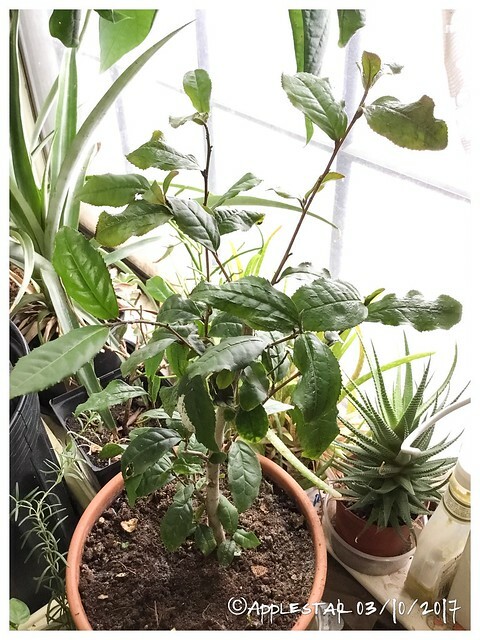 Winter Indoor Tomatoes -- I gave up on trying to grow tomatoes for the 2016-27 winter because I had been discouraged by the devastating and heart-breaking mite infestation that decimated most of the tomatoes and many of the peppers last winter. To add salt to the wound, the infestation, which persisted, had been near catastrophic for last Spring's newly started tomato seedlings as well -- so disappointing because they grew very well to near-planting stage for about 5-6 weeks, then rapidly went down -- and we are talking dozens of transplants and entire flats. Some of them recovered, which was interesting, but not nearly enough to warrant repeating the experience. I'm planning to try growing Winter Tomatoes again this 2017-18 winter and, this time, get the predator mites as soon as I see any suspicious sign of mite infestation. The ones I released thanks to a generous Amazon gift card holiday present has successfully fended off what could have been a sad repeat of last winter and most of my over-wintered peppers are recovering, so I hope to be able to grow tomatoes again with a more strategic Indoor Garden Patrol deployment. For Thanksgiving-December holidays Winter Indoor Tomato harvest with extra early and early maturing cool-temp-tolerant varieties, August 1 seed drop has been the timing I have found to work in the past. You might need to start even earlier like mid-July for average-later maturing varieties, particularly slower dwarfs could fall short of the hoped for schedule. My unconfirmed suspicion -- all based on general impression -- is that the plants become somehow aware of the 2-4 week period before and after winter solstice and slow down/stop growing. But if there are more advanced green tomatoes on the plant, they will mature and ripen as long as it's warm enough. If they have not grown enough, then they seem to just hang on the plant until after New Years to resume growing again. ...I still have some ladybugs left in the package from the fall-purchase, but I'm not sure if they are still alive -- I'll have to check. In the meanwhile, the already released ones are still around -- either originals or next generation from eggs they laid. 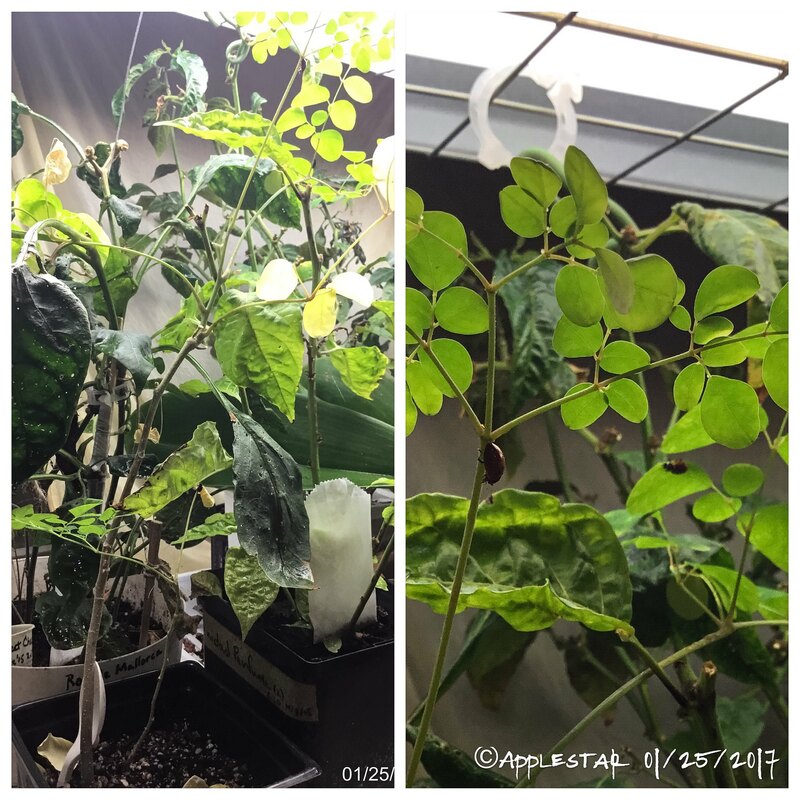 I saw several -- on the Yellow Room peppers and Winter Wonderland Dwarf Moringa and orchids yesterday. They could also be ones that escaped out between the inside and outside windows -- maybe they managed to find a crevice to hibernate in and are now waking up.... This is a good thing because ants have been invading -- recent warm temps must have thawed them out. 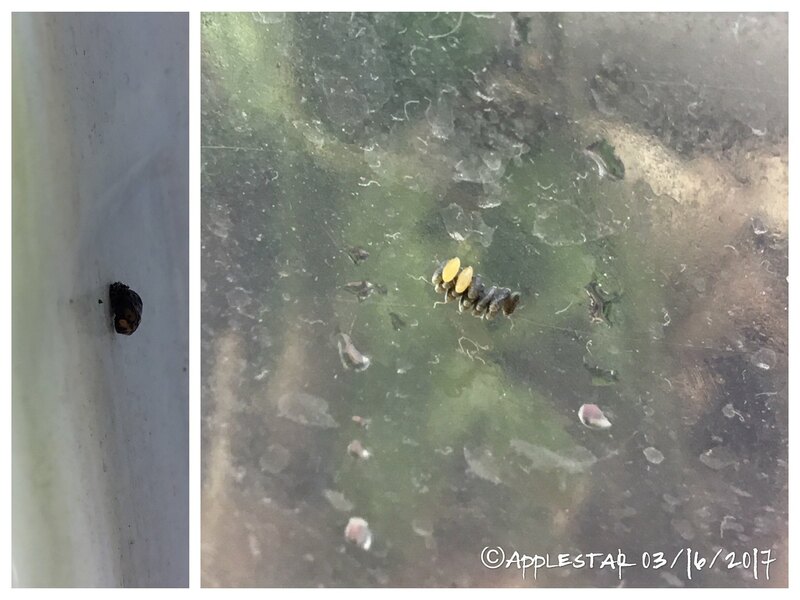 As mentioned before, spring thaw = ant invasion and subsequent increase in aphid and scale infestation. But everytime I thought about intervening, there was a patrolling ladybug, etc. It looks a bit messy because this is one of the mite-infested peppers that is recovering, so I drop mite-killed leaves at the base of the stems as much as I can, and the ones that fell between the container and the shoplight are left where they are -- in case there are predatory mites on the leaves (it stands to reason there would have been some on the heaviest infested leaves). I want them to climb back up the plant rather than tossing the leaves in the compost collector without any way for them to get back on the plants. The eggs were ready to hatch today -- haven't gone to look...they may have come out already There was also a pupa on the shoplight reflector. Not sure if the dark color means it's ready to come out (it could be -- reminds me of the color of Monarch butterfly chrysalis when they turn clear on just before eclosing). I usually see the opaque lighter orange colored ones. On the other hand, this might be the big larva I saw earlier which had been crawling around on the reflector, and maybe it had molted into the pupa form. Ladybugs love to lay eggs in my live oak tree and every year about this time I see tons of their larvae; what's cool about them is they remind me of little battle vehicles (like a humvee) and they do have a tremendous appetite for aphids.